The first step in the conventional seeding process is the initial ground cultivation or decompaction. This is a vital part of conventional seeding in which the soil is worked down to a fine tilth to prepare the ground to receive the seed. 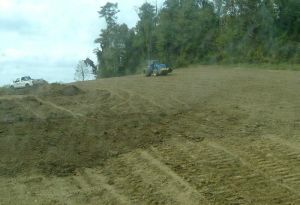 Cultivation is a achieved by ripping the ground using a power harrow. Following the cultivation, the second step in the conventional seeding process is sowing. The seed is sown by air seeders. The seed is then rolled into place to firm the seed bed back down and create soil contact with the seed in order to maximize the germination.